"Mischief!" is a collection of six stories about being a child from four through eight years old. In the course of the stories, Lynn gets so crabby she makes the dining room ceiling fall down, she dances to Gene Vincent, she conquers her fear of the school bully, and she locks herself in the bathroom at a Chinese restaurant and sings at the top of her lungs, thinking no one can hear her. The stories are each introduced by the spirited music of renowned folk musicians Bob Zentz and Jeanne McDougall. Released October 2007. © 2007 by Lynn Ruehlmann. It Happened in the White House: True Stories of the Eight Virginia Presidents and Their Wives is a charming book on CD. With the enjoyable characters created by storyteller and author Lynn Ruehlmann spinning the tales that tell the intimate secrets of selected presidents and their wives, you'll be thrilled to listen to these stories over and over again. As a historian, I always was delighted to hear stories about our American history. I was always sad to hear people say, "History is dull, all those names and dates." History, especially American History, is full of amazing characters who were real and important people in the development of our country. So you can imagine how happy I am to find and recommend this resource. 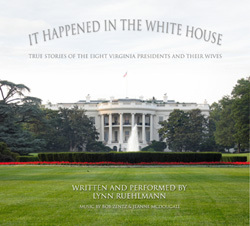 It Happened in the White House combines classic American music with stories about eight of our US presidents. All the presidents came from Virginia; the state of Virginia has given us the most presidents so far. George Washington and his wife Martha Dandridge Custis Washington's story is told by a friend who introduced the couple. Giving historical figures such as George Washington a real life helps children remember the importance of the first president and helps them bridge the span of time since the 1790s when Washington held that office. Thomas Jefferson had already lost his wife, Martha Wayles Skelton Jefferson, before he became president. His daughter, Martha, helped the president as hostess at the White House. This story is told from her perspective. James Madison and his wife Dolley Payne Todd Madison served the country as our fourth president and first lady. Dolley was truly loved by the public as First Lady and the heroine who saved George Washington's portrait from the English troops that burned the White House. James Monroe and his wife Elizabeth Kortright Monroe were fifth to the president's office. Elizabeth Monroe's servant tells their story, defending the shy first lady who found it difficult to live up to the expectations left by the stylish and social Dolley Madison. Ninth to the White House, and the fifth president from Virginia, was William Henry Harrison with his wife Anna Tuthill Symmes Harrison. His presidency lasted only a month. John Tyler thought he would relax at his home estate for the four years of his vice-presidency, but just one month into his leisure, he received a note telling him he had become president. This president had two wives. His first, Letitia Christian Tyler, died after an illness, so the story about President Tyler includes his courtship of Julia Gardiner Tyler. Our twelfth President, Zachary Taylor, and his wife, Margaret Mackall Smith Taylor, were in the White House only a short time. Mrs. Taylor loved and missed her husband so much during his career that she wished for a quiet retirement; instead he became president. She influenced her husband so much that he did not even vote for himself in the election. The last president to hail from Virginia was Woodrow Wilson. Wilson was a professor of political science and was our twenty-eighth president. His first wife, Ellen Louise Axson Wilson, died. He was lonely in the White House until he met Edith Bolling Galt. Their courtship was educational, as she knew nothing of politics. The two became inseparable. 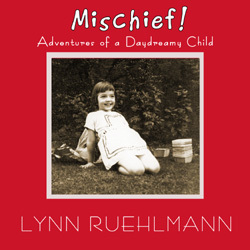 Lynn Ruehlmann is a wonderful storyteller who provides distinct personalities in each of her stories. If you didn't know better, you'd think each story was told by a different person. Children will love learning history with this CD. The music selections are American, including "Yankee Doodle," "Oh Susannah," and other recognizable favorites. So if you're wondering how to get your kids interested in history, It Happened in the White House: True Stories of Eight Virginia Presidents and Their Wives will do it. 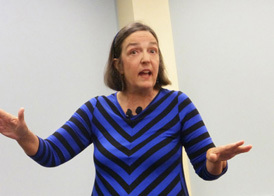 Kids will become interested in US History because it's their history, they'll know who the people were and want to know more because Lynn Ruehlmann brings the stories in a way they'll understand and enjoy. Reviews: Writer and performer Lynn Ruehlmann has tackled a very difficult event and complex historical character, producing a well-crafted story that will hold the attention of both teenagers and adults. Listeners come to realize the hardships endured by those who dared oppose the political feelings of the time. Students will be motivated to delve deeper into their history books after hearing this true story about slavery. Perhaps they will also draw a parallel to events in their own lives. An exciting breath of fresh air. Lynn Ruehlmann's fans, who have long recognized her to be a storyteller's storyteller, will be delighted to know that she has recorded Spy! 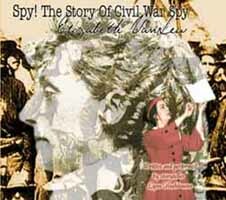 The Story of Civil War Spy Elizabeth Van Lew. Her telling of this story has been heralded by Virginian as being an enthralling tour de force, and bringing the story to the recorded medium should serve to broaden its appeal and introduce it to new audiences who will delight in this marvelous piece of story-theater. Ruehlmann's theater background is evident throughout the story as she uses a variety of voices and inflections to differentiate characters, time changes, and moods. She could not have chosen a more dramatic tale to showcase her considerable talent. Ruehlmann wrote Spy! After a great deal of research, much of it coming from the diary that Elizabeth Van Lew kept during the war. The story reveals the details of the life of a remarkable southern woman from Richmond, Virginia, who became an abolitionist after witnessing the consequences of a baby being sold out of the arms of its slave mother. When the War Between the States erupted, Van Lew, whose anti-slavery views were well-known, was urged by her brother to flee Virginia and return after the war was over. Replying that she was "a Southerner and a Virginian," she refused to leave. Van Lew and her mother were drawn into the spy business after the Battle of Bull Run in 1861, when their caring for union prisoners and wounded led to the passing of coded messages and other acts of espionage. Ruehlmann, assuming the persona of Van Lew's neice, the story's narrator, carefully details the tricks and devices that Van Lew used to get messages to the union army. The listener cannot help but admire Van Lew, who risked everything, including her life and the respect of her community, to bring justice to the social landscape of the country. Van Lew did not mind being ridiculed to accomplish her goal. Overhearing neighborhood children refer to her as "Crazy Bet," she reasoned that if people thought that she was really crazy, they would not suspect her of being a spy. Thereafter, she set about convincing the populace of Richmond that she was, indeed, crazy. They bought her deception lock, stock, and barrel. Meanwhile, Van Lew was hiding escaped Union soldiers in her attic and creating her own version of the Underground Railroad. That Van Lew made it through the war as a spy without being caught is testimony to both her genius and her acting ability. Ruehlmann relates her journey with humor, respect, and enthusiasm. Lynn Ruehlmann has given us a story that is well-researched, well-written, and masterfully delivered. It belongs in every story-lover's library.